Not many of us can think of just a few seconds that divide our lives it into two halves. Haseena can. In 1999, when she was just 21, her life was changed completely in just the few seconds that it took her former employer to throw concentrated sulphuric acid on her. Haseena wanted to be a fashion designer, but the acid attack blinded her and she couldn't achieve her dream. Yet, Haseena was not one to be put down easily. She fought the constant pain of over 35 surgeries to restore her face and her body, and struggled through them with patience and her family's support. 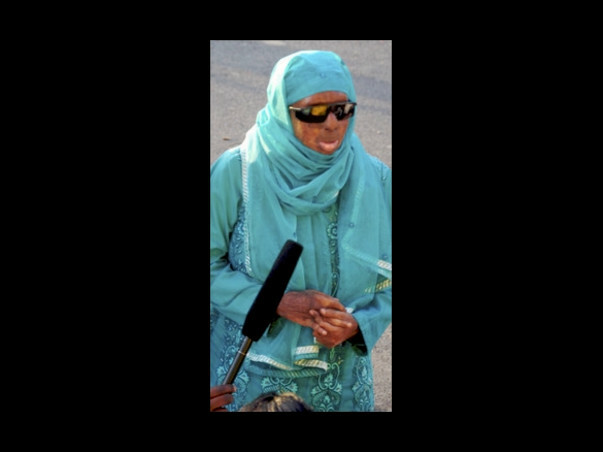 She fought against her blindness and learnt computers with the help of NGO Enable India, even with the difficulty of having to learn afresh everyhing she had assimilated so far in life. She fought the constant dejection and the memories of her life before the attack and the unbearable pain of the attack itself. She fought against herself. Today, Haseena is the only earning member of her family and has a job with the airforce in Bangalore. She uses a screen-reading software on her computer and her phone, to access e-mail and even Facebook. 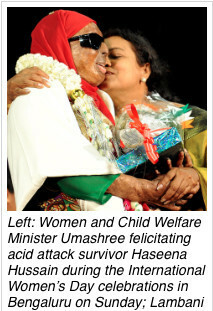 Haseena also actively helps other acid attack survivors in and around Bangalore, and counsels them through phone. On International Women's Day 2015, Haseena was presented the Rani Chennamma Bravery Award by the Government of Karnataka. We want to gift an iPhone 5C to Haseena. She has already been introduced to the world of touch-based smartphones and uses an entry level Android-based smartphone at present. An iPhone is known to have much better accessibility support for those who are completely blind, and this will help Haseena engage more actively with people like you and me, and also with other acid attack survivors. This will be a surprise gift for Haseena and will be personally delivered to her by her friends :). Do let us know if you would like to be there when we gift her the phone. Neither Milaap nor the creator of this campaign supports, endorses or has any preference for Apple iPhones or any other particular brand of smartphones. However, based on simple research on the internet and discussions with some visually impaired friends, the creator of this campaign believes that iPhone offers better accessibility features for the blind. We would be happy to gift Haseena with a smartphone from any other brand or manufacturer if it offers similar accessibility benefits. I would like to personally thank you for donating to gift an iPhone to acid attack survivor Haseena. It has been a while since this campaign ended and I apologise for not coming back to you earlier with an update. Since we have reached the target on this campaign, I contacted Haseena to tell her about our surprise gift, but sadly, Haseena politely declined to accept any gift from anyone. I have been trying to convince her to accept this special gift from you people, but she has remained firm with her decision. I would like to gift two phones to two other acid attack survivors - Sheela (name changed) and Sapna - using the funds raised in this campaign. Haseena has kindly consented to this. I REQUEST YOUR APPROVAL PLEASE. 28-year old Sheela was attacked by her ex-boss when she was working in Panipat, Haryana. She lost her right eye completely after the attack, and has low-vision from her left eye. She works with the Human Rights Law Network (HRLN) in Delhi, helping other acid attack survivors like herself with their legal cases. THE FUNDS FROM THIS CAMPAIGN WILL BE USED TO GIFT AN IPHONE 5S to SHEELA. 23-year old Sapna was attacked with acid in 2013 by a relative who wanted to marry her against her wishes. One side of Sapna's face and one hand are permanently scarred because of the burn injuries caused by the acid. THE FUNDS FROM THIS CAMPAIGN WILL BE USED TO GIFT AN ANDROID SMARTPHONE TO SAPNA. Both Sheela and Sapna volunteer with Make Love Not Scars, the organisation which I co-founded with Ria Sharma. The smartphones that you help gift them will help them in their work supporting acid attack survivors across the country. I wish to thank you for your donations to this campaign and once again, I apologise for not giving you a status update earlier. I can only imagine what you have gone through Hasina. You are a big idol for many. All the best.